The 39th Decorex International will take place this year at Syon Park, the spectacular London residence of the Duke and Duchess of Northumberland. The event will run from the September 18-21, 2016 and will boast more than 400 exhibitors from across the globe including some of the newest design names to watch. Decorex has established itself as the UK’s leading show specialising in the luxury design market. This year’s show marks the beginning of the London Design Festival and focuses on tracing the origins of design while acknowledging the inspirations and influential creatives that have shaped the industry in modern times. There is something to interest most design enthusiasts. For those interested in traditional techniques be sure to visit the Crafthouse. A set of four interactive rooms dotted around the show that will explore the domestic rituals of eating, bathing, working and sleeping and how they inform our definition of a home. 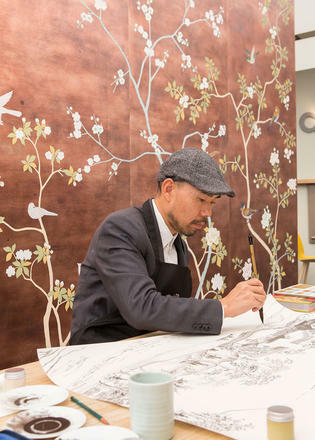 In addition, Decorex will host a series of seminars and talks featuring the likes of House & Garden editor Hatta Byng and renowned designers Tim Gosling and Nina Campbell. New and emerging designers, meanwhile, shouldn't miss the British Institute of Interior Design mentoring sessions on September 20. Participants will have the chance to quiz experts, including Susie Rumbold, May Fawzy, Harriet Forde and Yentl Flo, on an array of design topics. The event is a great chance for visitors to enjoy the magnificent and historically rich Syon Park, built in the 16th Century on the site of the Medieval Syon Abbey. To keep visitors going throughout the day there is a Champagne Bar (designed this year by 1508 London) as well as a selection of eateries to suit all tastes, such as the Syon Estate Restaurant and a luxury street food market. Decorex International takes place at Syon Park, London from September 18-21, 2016. Visit decorex.com for tickets and information.